NIAGARA-ON-THE-LAKE, July 25, 2013 – Premiers are working at home and abroad to successfully compete in the global economy. They discussed ways to strengthen their economies through collaborative actions on skills and training, international relations and trade, immigration, infrastructure and energy. Premiers committed to ensuring that all Canadians have the skills and training they need to compete in the global economy. 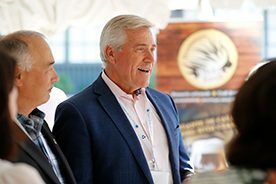 Premiers directed ministers responsible for education to explore ways to improve the alignment between secondary and post-secondary education and the skills required for Canadians to succeed. 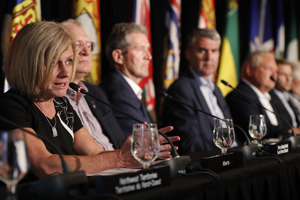 Premiers also tasked provincial-territorial education and labour market ministers to host a symposium on this issue with academic, business, and labour leaders, and to identify innovative best practices occurring across the country. Québec and Atlantic Premiers shared progress on the work of the panels they both put in place to review the impacts of recent changes to Employment Insurance (EI) on workers, communities and employers in those provinces. These changes were made unilaterally by the federal government without consultation or shared analysis and therefore without a full understanding of their effects. 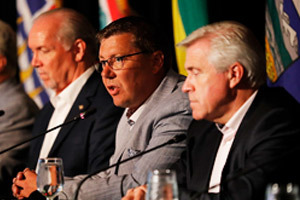 Premiers reiterated the importance of EI contributing to economic stability during times of temporary unemployment, and agree that meaningful consultation with provinces and territories should always be undertaken prior to reforms to the EI system, and that the program must support the unique economic circumstances of all regions in Canada, including seasonal industries, and must be more responsive to workers. Premiers recognize the importance of efforts to enhance international trade and commerce, including with key markets such as India and China, and through the Trans-Pacific Partnership. They strongly support the active engagement of provinces and territories at the table in trade negotiations in areas of provincial and territorial jurisdiction. 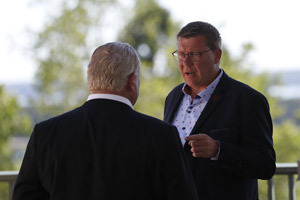 Premiers agreed their trade ministers should continue to strengthen their exchange of information and coordination of trade negotiation priorities and activities. Foreign investments are also key to Canada’s global competitiveness, and it is critical that the federal government engage provincial and territorial governments in the foreign investment review process. 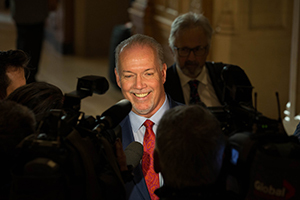 Premiers reiterate the importance of concluding an agreement with the European Union which would be beneficial to their citizens and businesses, and commit to continue their involvement in the negotiation process in order to conclude a comprehensive agreement as soon as possible. Premiers support enhanced coordination to trade relations and regulatory cooperation with the U.S., and expressed the desire to work closely with governments and businesses in both countries to mitigate U.S. measures that make the border a greater impediment to trade. Premiers are disappointed with additional Country of Origin Labelling (COOL) restrictions imposed by the U.S. in May 2013 and hope the U.S. will move quickly to comply with its international trade obligations. These new restrictions will only prolong and worsen the negative effects COOL has already had for agricultural producers and processors in the U.S. and Canada.